498 pages | 31 B/W Illus. The Art of Voice Acting covers all aspects of the craft and business of performing voiceover. This sixth edition is reorganized and completely updated to include the latest information on how to get started in voiceover, performing techniques, setting up a personal recording space, voiceover demos, the basics of running a voiceover business, working with agents, unions, and much more. Dozens of URL’s are included with additional resources and several chapters include all new scripts written specifically for this edition. Two new chapters include contributions from some of the voiceover world’s top professionals. Additional content can be found on the Voice Acting Academy website at AOVA.VoiceActing.com. This is the perfect tool for aspiring voice performers, radio announcers, and stage and screen actors. 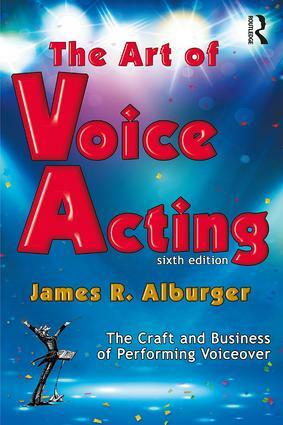 James R. Alburger is an award-winning producer, director, performance coach and voice actor. After a 25-year career in recording studios and television (receiving 11 Emmy® Awards), he opened VoiceActing, LLC and The Voice Acting Academy. He teaches workshops on performing voiceover, voices a variety of audio projects and is an expert in personal, professional studio design and audio production for radio, location sound recording and audio post-production for film and video. He also provides coaching for companies of all sizes, using his voice acting techniques to teach business professionals how to be more effective communicators.